Just realized that I never published the update from a couple of weeks ago, duh. So it’s a two-fer today. Except this one will have pictures. 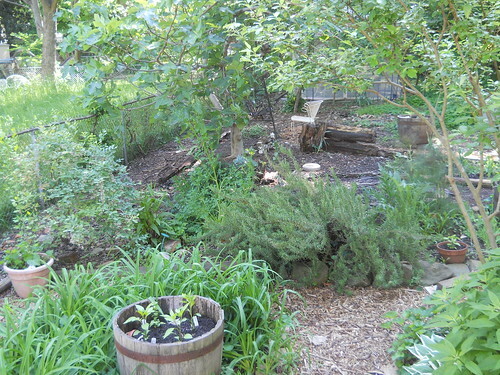 I spent a lovely breezy morning in the Back Forty, and pretty much finished planting the rest of the garden. Even though I pronounced that I was going to be weaving and preparing warps and such yesterday, the forecasted rain did not appear until after dark. 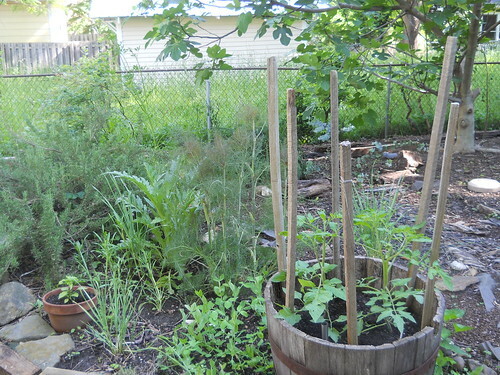 When you have a garden, especially one as mosquito-ridden as mine, you have to work it when it needs to be worked. I didn’t really mind, although sometimes it would be nice to split in two and be able to do both at the same time. That’s my neighbor’s hayfield to the left. Just kidding. 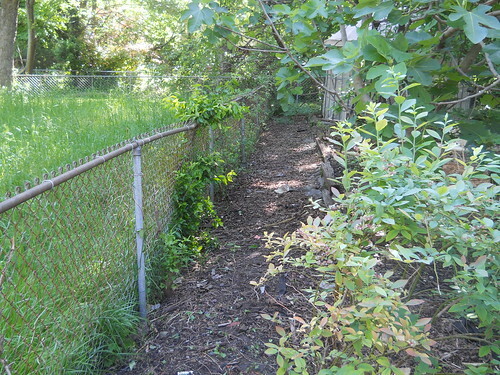 Nobody has bothered to do anything to the yard for months after spending beaucoup bucks on landscaping. Puzzling behavior. Planted along the side fence: Violet’s Multicolored butterbeans and Kentucky Wonder green beans from Southern Exposure Seed Exchange. I’m delighted that Deep Roots Market is now carrying a good selection of their seeds. I also bought a few seedlings from them: Genovese basil, Zephyr squash, Straight Eight cucumbers. Most of my plants came from Handance Farm and Weatherhand Farm at the Greensboro Farmers’ Curb Market. I added a couple of German Johnsons and a Persimmon because Sandy was worried that we didn’t have enough slicing tomatoes. A valid point, since we tend to lose a lot to critters and some of these wonderful old heirlooms are bred for taste, not heavy production. As usual, I have lots of volunteer tomatoes which are probably Juliets. I crossed my fingers and planted yellow crookneck and zucchini squashes a couple of weeks ago, and so far they are doing well. Cucumbers and squashes do not grow well for me in this place. 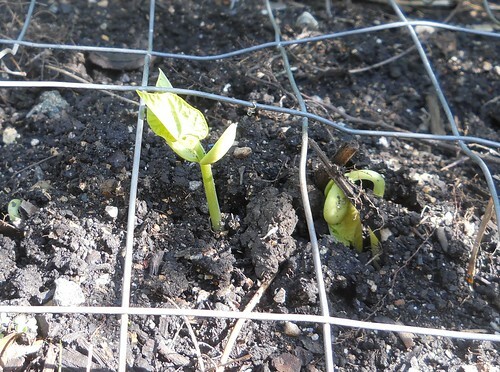 This morning I planted okra and purple hull and whippoorwill field peas, more carrots, lettuce (in a shady spot) and a bunch of old seeds that I pretty much decided to plant instead of throw out. Many years I have cast them out into the back and some would come up wherever they landed. 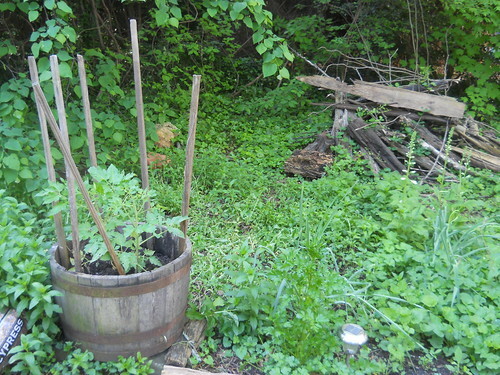 This year the garden is still about a third overgrown so I found little spots here and there to plant them. Some I don’t know what they are, but I suspect they are either gourds or winter squash of some kind. So I may or may not have trombincino squash, radishes, canteloupes, etc. this year. 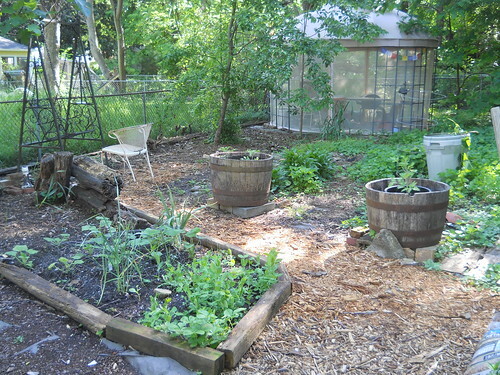 The Back Forty is SO much different after twelve years of developing the soil and following permaculture principles! I used to hit thick red clay a few inches down. (This is still true in the front.) I was reminded of this when I planted a raised bed that had been left alone under a rock pile for a couple of years and thousands of ants had settled in. The soil on top is redder in that area from them bringing up the soil from beneath. This is excellent because clay does have many nutrients that can’t usually be used because it is so heavy and thick. Now this area that used to be all grass and violets is rich in earthworms and black soil. 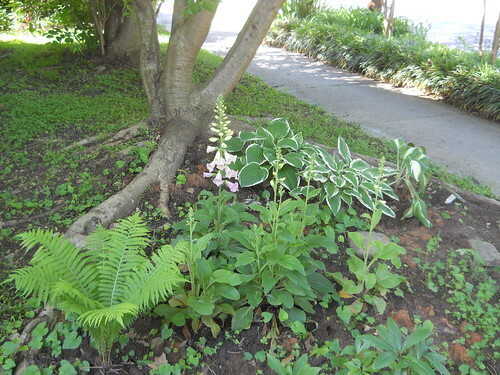 I’m moving rocks and flowers and shade-tolerant plants to the front yard this year. So far I am very pleased with it, especially since it hasn’t cost me a penny. Lenten roses, foxgloves, ferns, hosta, yarrow, four o’clocks, parsley, oregano, thyme, rosemary. And some of those cute little blue star flowers that I love, but they aren’t blooming now. 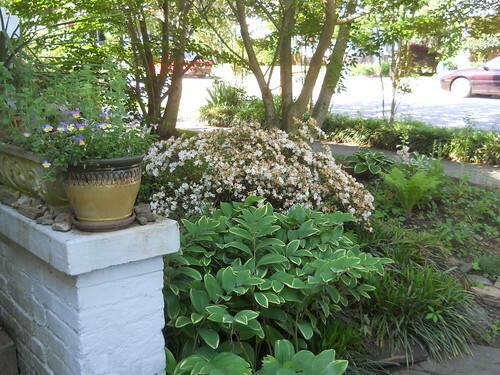 Solomon’s seal, bloodroot, my fading azaleas, and more ferns nearer the door, and violas, oregano, a rescued palm plant up on the…the…what do you call that thing? A wall. Seems like there oughta be a special name for it. Tell me about that cute little screened hut in the back. Oh, we bought that gazebo kit from Home Depot several years ago when it was on markdown. Managed to fit that bad boy into our (then new) Honda Fit. I put down landscape fabric and cement pavers. Now I have a place to do wet work such as papermaking without getting devoured by mosquitoes. I had to buy a replacement roof and screen last year because I let vines crawl up on it and they ruined the screens and the original roof was badly made. The new one is better and I hope it lasts longer.